This simple Baked Brie with Cranberries and Pecans appetizer is a tasty, festive addition to any holiday menu. With some much going on during the holidays, keep your menu planning quick and easy with appetizers like this warm Baked Brie with Cranberries and Pecans. Not only is it a flavorful nibble to jumpstart your party, but it comes together in minutes – perfect for spur-of-the-moment get-togethers. Who doesn’t like to have a go-to appetizer in their back pocket? This Baked Brie with Cranberries and Pecans is ours. 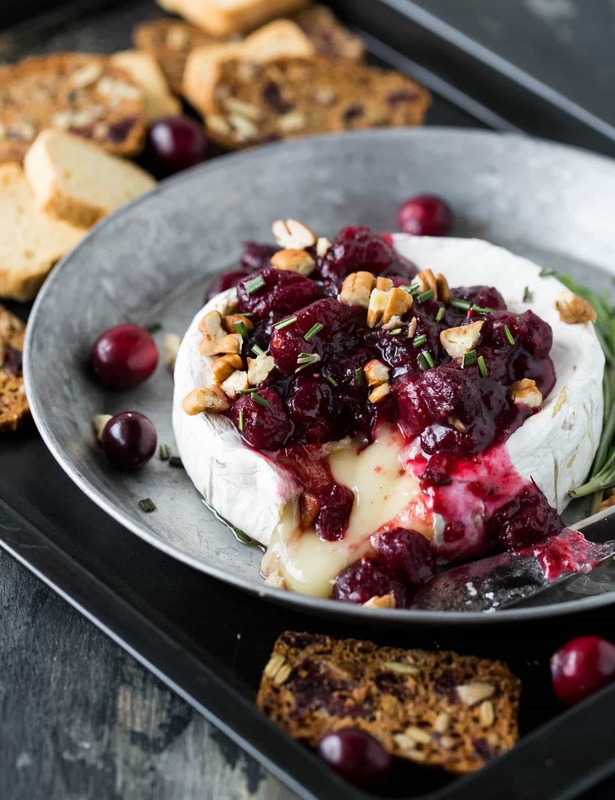 Not only does it look impressive, but the combination of tart cranberries, sweet maple syrup and savory rosemary is one tasty topper to the creamy, rich brie cheese. Tip: Don’t have fresh cranberries? Frozen berries work just as well so stash some berries in the freezer and you can enjoy this tasty snack well beyond fresh cranberry season! 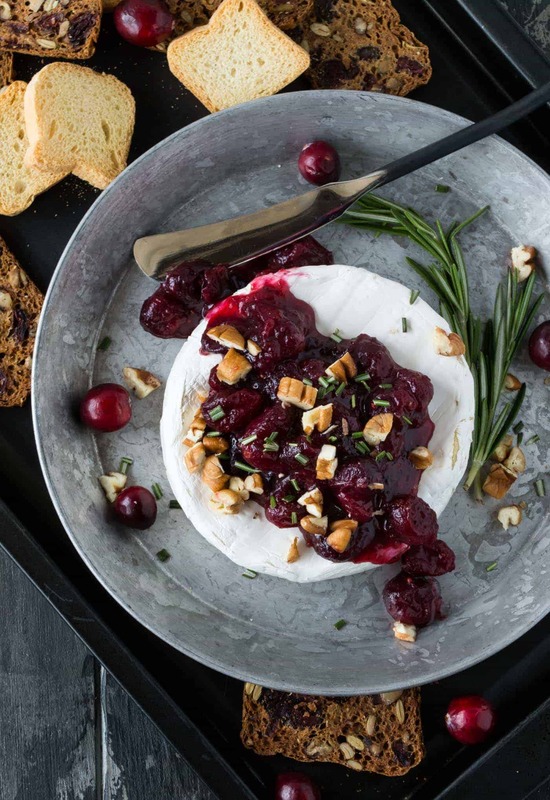 You can easily make the cranberry topping a few days ahead of time and simply reheat before spooning over the warm brie. Serve with any variety of crackers or toasts, and kickstart your holiday festivities in gorgeous style! This simple appetizer is a festive addition for the holidays. Preheat oven to 350 degrees. Line a small baking sheet with parchment. Place cranberries, maple syrup, butter, rosemary and salt and pepper in a small saucepan. Bring to a boil over medium heat. Boil for 3-5 minutes or until syrupy. Remove from heat and stir in lime juice. Bake brie for 15 minutes or until soft. Carefully transfer brie to serving dish. 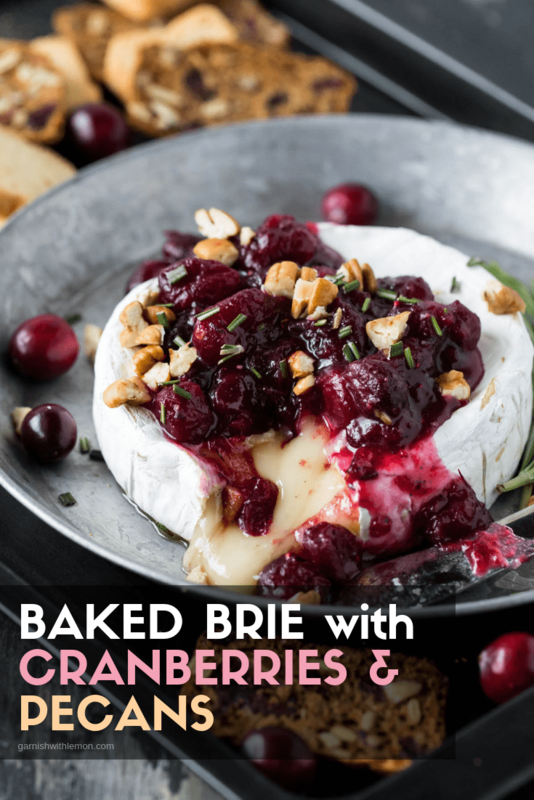 Pour cranberry mixture over brie and garnish with chopped pecans. Serve immediately. The cranberry mixture can be made a few days ahead of time and stored in the fridge. Warm mixture in the microwave prior to serving.